The college farm soils varying from shallow, sandy loam to medium deep clay soils with pH ranging from 6.5 to 7.1. Almost all the area at main farm is under irrigation, which is provided through Rajaram Bandhara and four existing wells on the farm. The Data on weather parameters viz. rainfall, number of rainy days, maximum and minimum temperatures, morning and evening humidity and evaporation recorded during different Meteorological weeks for the year 2017 at College of Agriculture, Kolhapur are presented in Table – 1. The data presented in Table-1 revealed that the total rainfall received during the year 2017 was 891.6 mm in 65 rainy days, which was deficit by near about 16.0 % to the average annual rainfall of this region (1057 mm). The onset of monsoon was normal but the quantity of rainfall is less in the month of July and August. The distribution of rainfall was quite good. 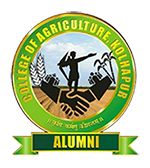 UG Level 2 For practical’s of crop production courses viz., Agro-236, Agro-248 & for practical of seed production module, AEL Agro- 4813. Practical’s are conducted by using models/specimens of seed, fertilizers, herbicides, manures, tools and implements, weed and crop plants identification, different methods of sowing, irrigation layouts, agro meteorological instruments, methods of fertilizer application, methods of weed management, production techniques of different field crops, use of modern software media like PowerPoint presentation, develop entrepreneurship among the students regarding seed production of field crops and their processing. 1 Agronomy Plant & soil analysis laboratory Flame photometer, Sox let apparatus, Micro Kjeldhal Digestion unit Macro Kjeldhal, pH Meter, Electric Conductivity bridge, Oven, Distillation water unit, Electronic Balance, Grinding mill and Slide projector.